Veneers or Crowns: Which Is Right For Me? When you have a chipped tooth, you want to get it taken care of as quickly as possible. The good news is that there are few options for doing so. Veneers and crowns are two of the more common options. 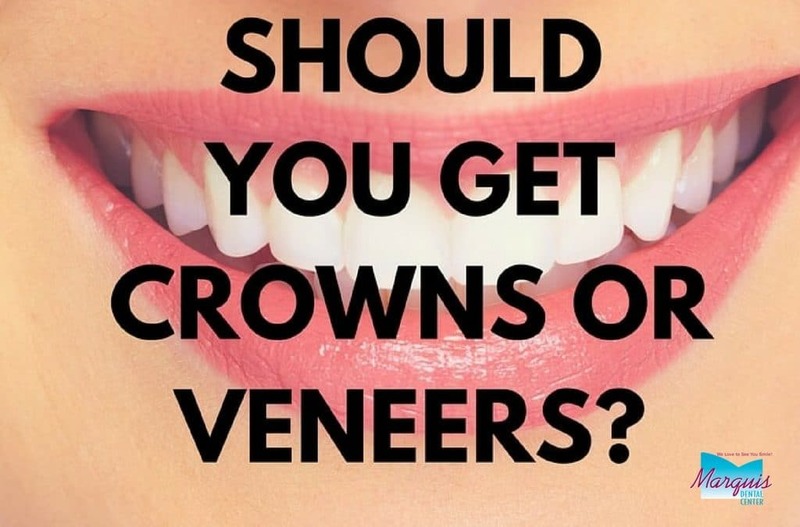 So the question is, veneers or crowns; which is right for you? The answer depends on several factors, such as the condition of your natural tooth, your dental history, and your budget. Veneers and crowns might seem similar, but they are actually different in many ways, from application to price to durability. It’s important to make the right choice to avoid more dental work down the road. Veneers are thin pieces of porcelain that are molded to fit your teeth. It then attaches to the front of the tooth with the goal of improving its appearance. They can also be made of resin or other composite materials. Crowns are larger and cover most of the tooth. They are used to improve a tooth’s structure, as well as its appearance. They are commonly used after procedures like root canals. Both veneers and crowns are custom-made and matched with the rest of your teeth so that they blend in as seamlessly as possible. Veneers are typically used for small chips and other cosmetic issues that do not impact a tooth’s structure. Crowns are most commonly used for more severe chips and breaks that can’t be covered with a smaller veneer. That said, there are several other factors that may influence a decision to go one route or the other. One big question that comes to mind when considering crowns or veneers is durability. You want to make sure that you are choosing a solution that will stand the test of time so you don’t find yourself back in the dentist’s chair any more than you need to be. Veneers typically last 7-15 years before they need to be replaced, while crowns usually last 10-15 years. Crowns are made of more durable material so they do tend to last a little longer. However, veneers are a little easier to replace because they do not cover your entire tooth. A crown is more permanent and more involved to replace whenever that time comes. Veneers are also more subject to breaking because they are thinner and made of more delicate porcelain. They are not recommended for people with habits like biting their nails, grinding their teeth, or chewing on ice. Another important factor to consider when weighing veneer vs. crown is price. The price is similar for crowns and veneers. Your dental insurance may help guide your choice depending on what is or is not covered. Veneers are typically considered a cosmetic procedure and not eligible for insurance coverage, while crowns are considered a non-cosmetic dental expense. While veneers cost less than crowns, keep in mind that they are more likely to chip, crack, or wear out than a crown. A crown is ultimately more expensive to place and replace, but it may end up being the better investment in the long run. The best way to know whether crowns or veneers are the right choices for you is to visit Marquis Dental Center for an evaluation of your chipped or broken tooth. Our doctors will assess your situation and provide you with options that best meet your needs. In making the decision on veneers vs. crowns, we take all of the factors mentioned here into account — price, durability, and your dental health. Call us today to schedule your consultation.